Last month, we talked about ways that user research can go wrong. This month, we’ll discuss how research planning can reduce costs and decrease the time it takes to perform user research. One of the biggest challenges in performing user research is determining which research approaches to apply and when to apply them. The research methods you choose are dependent upon a variety of factors, including budget, schedule, development phase, business goals, and research questions. If you are familiar with various research methods and their applications, your organization’s business goals, and product development constraints such as schedule, budget, and the development process, you can create an end-to-end user research plan to cover an entire product development cycle. Having a user research plan helps you to establish and communicate research goals and expectations regarding logistics and set research milestones for a product development effort. For a User Experience team, the key phases of a product development cycle are Discovery and Design. Discovery consists of defining the market for a product, its potential users, and product requirements. 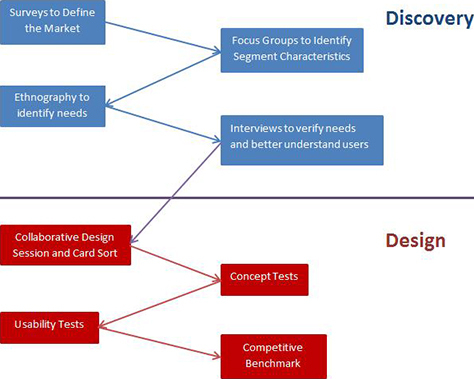 Common user research approaches during the Discovery Phase include survey research, focus groups, expert interviews, and ethnography. The Design Phase involves bringing a product to life through product or user interface design and refinement. User research during the Design Phase focuses on gaining a deeper understanding of users, confirming research findings from the Discovery Phase, identifying the relative value of various features, and refining a design as it evolves. Common user research methods during the Design Phase include concept testing, usability testing, and competitive benchmarking. Understanding the different challenges you’ll need to address during these different phases allows you to plan your user research effort throughout a development cycle. Planning ahead of time lets you prepare for user research studies in advance, reducing the time and effort you must devote to a given research activity. For example, once you’ve identified your target users, you can start building participant lists and networks to facilitate recruiting. When preparing for your first study, you must establish communication with many potential participants and select study participants from that pool of participants for your study. Once you’ve established that participant pool, it becomes easier to find participants for subsequent studies, simplifying your recruiting efforts, reducing the man-hours you must devote to contacting potential participants, and shortening your research schedule. Over the course of multiple studies, this preparation pays enormous dividends. The main goal of the Discovery Phase is to define the product your team is developing. To do that, you must understand the market and the needs of users within that market. Therefore, the first step in planning user research is understanding your team’s information needs. Your organization’s business goals always drive its need for user research. Understanding these goals and needs is a little more difficult during the early part of the Discovery Phase, before you’ve even defined a product concept. At this early stage, your business goals tend to focus on serving a given market. So, through your user research, you should endeavor to understand that market, define its segments, model the users belonging to them, and learn about the needs of those users. Surveys are an effective way of getting an overview of a market and understanding its characteristics. Through the results of a survey, you can define your market size, identify market segments, and define the demographics of the different segments. However, surveys can tell you very little about user needs and behavior. Following your survey research, you’ll need to learn more about users and their behavior. Your best option for identifying users’ needs is some form of contextual user research. Performing any kind of needs-finding research that uses self-reported data—including interviews, surveys, and focus groups—is notoriously unreliable. People have a great deal of difficulty being objective about their own lives, and they tend to be blind to the workarounds they employ in meeting their needs. If you ask people what they need, they’ll tell you a better, faster, and cheaper version of what they already have. Steve Jobs was famous for saying, “People don’t know what they want until you show it to them.” Contextual research approaches such as ethnography or interviews that you conduct within the context of product use, whether at home or in the office, circumvent this difficulty by letting you directly observe users. This allows you to identify needs from their actual behavior. This kind of research can also provide quite a bit of information about a user’s environment and behavior, which can help you to further define a product. Once you’ve identified a need, the next step is determining the best way to meet that need. At this point, you define the product. The product’s primary features usually target meeting the identified user needs in some way. The nature of the needs often determines the form the product takes. For example, if a need tends to arise when a user is in a coffee shop or walking around outside, the product would likely be a mobile app or a portable device. When defining a product, user research focuses on learning more about current user behavior and verifying identified needs through additional interviews, focus groups, and other forms of generative research. Finally, you must gain as deep an understanding of your users as possible to inform design. This includes identifying additional desirable features and defining the scope of a product’s complete feature set. It is during this phase of research that you might decide to develop personas. The goal of the Design Phase is to create the design for a product. User research during the Design Phase focuses on gaining an understanding of users and their needs to inform design. As designers develop concepts, you can do concept testing to evaluate whether a design adequately meets users’ needs and creates an effective vehicle for delivering a solution. Activities such as collaborative design sessions and card sorting let you gather ideas about how to design a product to best meet users’ needs. This research also helps you to prioritize a product’s potential features—again to inform design. As a product’s design evolves, usability testing can help to ensure that its user interface enables users to realize the benefits of the product. Usability testing should be iterative. Include some directed tasks during concept testing to ensure that you discover usability problems early, before the development of a user interface element begins. Doing iterative testing helps you to ensure that any design changes your team has made in response to prior tests have successfully resolved the issues. Competitive benchmark testing allows you to see how your product stacks up against its competition or against your alternative designs for a user interface. During this period, you should be able to identify competitive differentiators for your product. These are the attributes that make your product different and better from the competition. This research informs marketing as well as design. Generating an end-to-end user research plan can help you to save money by leveraging the findings of and resources from previous studies. As you envision the product development cycle, create a rough user research plan at the very beginning, then refine your plan as additional findings come to light. Start with a general plan that segregates Discovery and Design into separate phases. Then identify what you already know about the market, users, and their needs. If you are familiar with a market through your prior research, you might already have sufficient data about that market, so you can probably skip some of the survey research. Beyond that, build a framework that is flexible, but well structured. Figure 1 shows an example of user research framework for a Web product. When employing an end-to-end user research plan, make sure that you respond to data as it emerges. For example, if important data is not coming to light through interviews, you may want to try another approach to acquire the information you need—for example, journaling or ethnography. It is important to utilize the proper research approaches to satisfy needs as they arise. So fill out your tool chest by making sure that you are familiar with as many research approaches as possible.